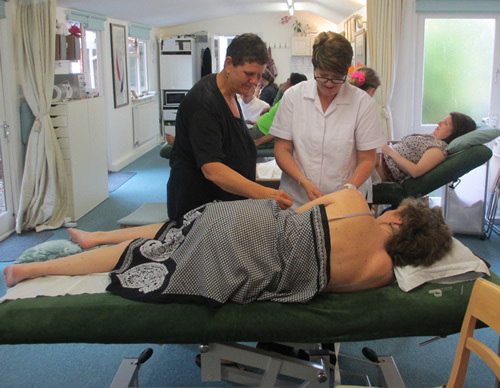 I joined the Bodyharmonics Acupuncture Course 2012 after completing the first year of a degree which had left me mentally and emotionally drained. I was really not enjoying it and my enthusiasm for acupuncture was eroding. Fees would also be increasing and I knew this would cause difficulty in the future. This is not to say that the Bodyharmonics course is an easy option, it takes hard work and dedication, but it is fulfilling and fun. It is clear that a degree is not necessary to practise acupuncture successfully and the price of a diploma is a fraction of that of a degree. Also, the membership costs of the statutory body, the Acupuncture Acutherapy Council and the insurance are not prohibitively expensive. I was not working full time, but for a student who does I think it would be fairly straightforward to take off the odd Thurs and or Friday once a month, than particular days in the week, every week, for a degree course, so attendance is not a problem. I had read previous reviews, spoken to previous students and visited Maria before the course. I found her to be bright and enthusiastic and I knew I would be in good hands, especially after observing her with a patient. The first weekend of the course was incredible. We learnt theory in the mornings and practical point location during the afternoons with actual needling. Every student was observed inserting needles to ensure accuracy, with due regard for hygiene. We practised on each other and I feel this is important, as you can’t really expect a patient to experience a treatment that you haven’t had yourself. 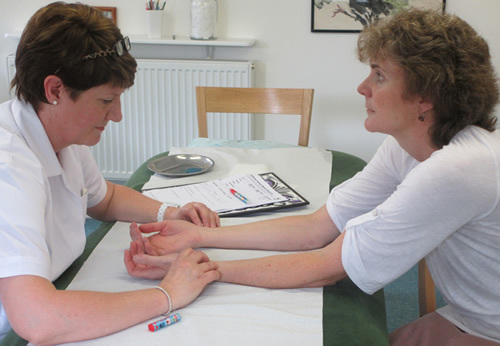 CAROL ASPINAL ACUPUNCTURE TESTIMONIAL. We looked for case studies from that weekend onwards. I had no potential clients, unlike Tui Na students who would presumably practise on their current clients. This did not hold me back in any way as friends and family were eager to assist. I did complete a business card drop where I live and advertised in my local Costa, (which is worth a try as long as you are advertising a “not for profit” local service). As a student practitioner, treatment was free, but I was insured and this was useful information for potential clients, although not one person has asked to actually see a copy of it!. I only had one response from Costa and one from the leaflet drop, but from these contacts I made several others on recommendation. The treatments, even in the early stages, were working, and word spread. This was a tremendous boost to my self confidence and encouraged me to learn more. I believe that the first year of the degree helped enormously with the theory. Other non Tui Na students would have completed the one day TCM theory as a minimum, but I found that some were more confident than others with regard to understanding. I am not sure that some individuals did enough theory study in their own time even though there are some excellent books available which are straightforward. One of the really useful things to know is that the exams are based entirely on the information that Maria gives in her notes, so it is pointless to read too widely. This may sound like a contradiction to my previous statement, but it is really important to understand the basic principles and organ functions. For example; the Spleen controls the Blood, it is then easy to understand the Syndrome of Spleen not Controlling Blood. Or in the case of the Liver, which ensures the smooth flow of Qi for digestion, emotions and secretion of bile, therefore stagnation of Qi leads to abdominal pain, anger, irritability and PMT. The notes do not cover all the points and all the syndromes, but do cover the points most commonly used and the most common syndromes. The tongue and pulse paperwork and tuition is straightforward, where this was complicated on my last course. Maria’s course is not based on the five elements, but does mention them in point descriptions, so it is worth having some five element knowledge (again, there are some excellent books available). With reference to exam preparation, the tests at the beginning of each new weekend were extremely useful, as the format is the same as for the exams. To conclude I would say that Maria is an excellent and knowledgeable tutor who clearly has an enormous passion for what she does. The course is really enjoyable but a challenge. The exams are supposed to stretch you, as retention of knowledge needs to be assessed; it is a professional qualification after all. You will have immeasurable self confidence after completing the course, which all my degree friends have since commented on, and found surprising. I wouldn’t hesitate to recommend the course to anyone, as I did on the last day, to a potential student who had gained a degree some years ago, but had lost her self confidence. The course would be perfect for her.